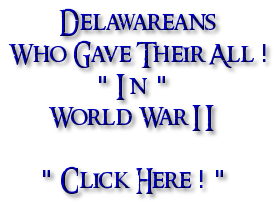 The following listing is provided in the memory of the Delawarean's that "Gave Their All" to their State and Country while serving in the Armed Forces of the United States during World War I. Those included are those who died during World War I which the United States entered on "April 6, 1917" until the war ended on "November 11, 1918". There are some soldiers shown below that died soon after the Novemeber 11th date that are believed to have either "died of wounds" and/or "died of disease" suffered as a result of the war. I'm currently in the process of creating, and/or linking, "online memorials" for these honored men. You will see a blue "Yes" behind the names of those that I have found and by clicking on the "Yes" you can see the online memorial that was created for them. These "Online Memorials" are all on "Find A Grave" which allows you to make online memorials to loved ones and others for free. 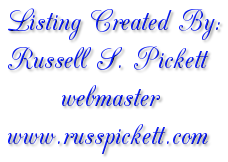 If you aren't familiar with this site you should check it out! It's an amazing concept. If you know where any of these men are interred, have a picture or more information about them please let me know by sending me an "email - (by clicking here)" so that I can make changes, update a memorial, and/or create an online memorial for them. 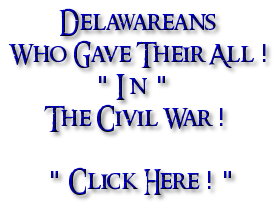 This is just a small way of making sure these Delaware soldiers that "Gave Their All" ARE REMEMBERED!! 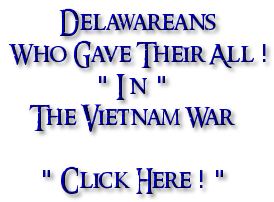 There are currently " 92 " Delawareans on this website. Please Go to the bottom of this page! 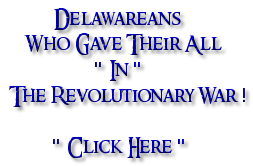 Wilmington, DE " Yes "
Accomac, VA " Yes "
Kennett Square, PA " Yes "
Odessa, DE " Yes "
Yorklyn, DE " Yes "
Sep. 30, 1918 " Unknown " " Yes "
Harrington, DE " Yes "
Camden, DE " Yes "
1918 " Unknown " " Yes "
Smyrna, DE " Yes "
Georgetown, DE " Yes "
Air Service " unknown "
Townsend, DE " Yes "
Milford, DE " Yes "
Selbyville, DE " Yes "
Nov., 1918 " Unknown " " Yes "
Greenwood, DE " Yes "
Seaford, DE " Yes "
Taylor, James E. ~ PH ~ unknown ~ Private Army " unknown "
Lewes, DE " Yes "